The Brighton handbag was added to the Brighton line of stylish accessories in 1993. Each Brighton handbag goes through 20 steps during its creation. Upon completion of the process a leather patch, embossed with Brighton's statement of quality and an individual serial number is added. As you can see they really do put their heart into every product they make. It is for this reason the company is known for its heart logo. 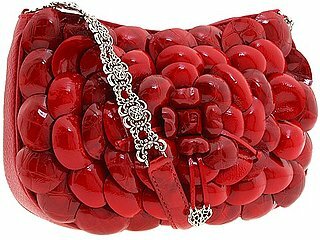 Components for some of the handbags are manufactured internationally in countries such as France, Italy, Spain, China, Taiwan, Korea and Japan. Brighton handbags are handcrafted in California. At no time are there more than ten being made at a time. There is an attention to detail followed as a rule by Brighton craftsmen that is an exception in this industry. For example there is no tag explaining that the 'marks' and 'scars' are your "guarantee" of genuine leather-they painstakingly cut around the scars- to offer you, a flawless leather handbag. Each handbag is individually numbered, and is registered by its owner. Once registered, they are guaranteed. The leathers selected are the best from all over the world, and the hardware all originally created by Brighton artists and craftsmen, sterling silver finished, and protected from oxidation for everyday use. The Brighton name has become to mean one-of-a-kind jewelry and fine Italian leather articles that are adorned with exquisite silver-plated ornamentation. Brighton's heart logo fits the company philosophy that the difference in products is a true attention to detail. Most of the items in the Brighton collection have some unique detail, a message engraved on a bracelet or a Brighton handbag with a favorite photograph, that gives them special meaning to the owner. This then leaves a lasting memory to cherish for a lifetime. This has also led to many women having their own Brighton collection. Brighton handbags are available in nearly 6,000 specialty stores nationwide and 50 all-Brighton stores from coast to coast. Brighton handbags are not sold in department stores or on the Internet. This is keeping with the owner/president policy to only do business with stores with world class customer service. This is reinforced with a 2 year warranty against any manufacturer defects. This lush Brighton handbag classic collection features opulent etched plaques, polished buttons and spinning hearts. It features a 12" hand laced shoulder strap, front zip organizer, contoured pocket as front detail. An interior pocket system with striped lining completes the handbag. Measures 11 x 8 x 5 and MSR is $240.00. Making this a favorite among discerning women. This Brighton handbag got its idea from Historical American Citrus labels. The casual styling is accented with enameled floral charms and sparkles. This is a colorful and fun collection. The features include 5.5" handles, reversible, inside zippered pocket and a magnetic closure. Dimensions are 9.5"W x 7"H x 3.5"D with a suggested retail price of $145.00. This Brighton handbags has a new fashion slant. It is tapered, simple and fashion forward. Features: 6" handles, key holder, back pocket with zipper, front pocket with a magnetic snap, zip top closure, custom Brighton scroll lining. 9.00"W x 6.00"H x 2.5"D and carries a suggested retail price in the $190.00 dollar range. A soft unconstructed shape featuring a new fashion color! Features include 9" handles, inside zippered pocket, key holder, 3 divided interior sections (two ziptop closures, one magnetic closure) two side pockets with tabs, back pocket and custom Brighton scroll lining. 1"W x 6.5"H x 5"D sporting a MSR price of $230.00.